Expectations have been high when it comes to young attacker Ebuka Okafor of Warri Wolves, some of the expectations being “self-inflicted”. In September 2009, after scoring a goal in the first round of the Nigeria Premier League 2009-2010, he apparently expressed to a local newspaper that it was “very possible to emerge as the leading goalscorer on the local scene this season”. Dissapointingly, Okafor scored only two goals during the season. Although it is fair to say that Okafor is not a notorious goal poacher in the Nigeria Premier League, he is nevertheless one of the most exciting teenage prospects in local football. His start to the 2010-2011 Nigeria Premier League has nothing less than impressive. Warri Wolves FC won promotion to the Nigeria Premier League in 2007-2008 and 2008-2009 was their first season at top level. A few weeks before the season started, Okafor was included in the squad of the Golden Eaglets, the Nigeria U-17 national football team. Okafor scored two goals for Warri Wolves FC during the season, learning a lot playing alongside great attacking players such as Fengor Ogude, Ekigho Ehiosun, Gift Atulewa, Anthony Ujah, as well as playmaker Nosa Emmanuel Igiebor. Okafor kept his place in the squad of the Golden Eaglets during the season, being included in the squad in January 2009 as well. However, I am not able to document that he has actually played any official match for Nigeria U-17. Most other players in the two mentioned Golden Eaglets squads were born in late 1992 or 1993. According to http://www.football-talents.co.uk, Okafor is born 10.01.1992, which could very well be true, although I actually thought he was a bit younger. According to the same source, his full name is Bonaventure Ebuka Valentine Okafor. As already written, Okafor scored two league goals for Warri Wolves FC during 2009-2010. As far as I know, Okafor has never been part of the Flying Eagles, the Nigeria U-20 national football team. A natural goal for Okafor should be inclusion in the Flying Eagles squad for the 2011 Orange African Youth Championship that will be played from 18.03.2011 to 01.04.2011 in Libya. My experience is that it is often difficult to define precisely the position of an African football player. Okafor is described as a “right-winger”, a “striker”, a “pacy winger”, a “dashing forward” and a “darting forward”. I personally define Okafor as a winger, known for his ability to beat the opposing full-back either with skill or with speed, often aiming for strong striker Ekigho Ehiosun with his crosses. Okafor has previously expressed that Liverpool FC winger Joe Cole is his role model as a footballer and he has also compared his style of play to the Englishman. Nosa Emmanuel Igiebor, Fengor Ogude and Anthony Ujah have all left Warri Wolves FC for Norwegian clubs during the last two years. Ebuka Okafor could very well be the next one heading for European football. The picture is taken from www.mtnfootball.com. 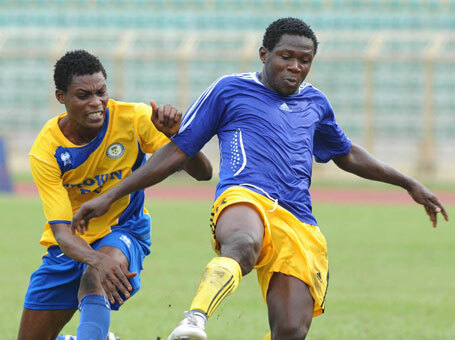 Okafor is the player in blue while the other player is defender John Fayoseh Fashanu of Crown FC.